Audience is course named Macromolecular Crystallography, or Biological x-ray Crystallography. Enrollments range from 10--30 students in a major biochemistry or structural biology department. Primarily for Undergraduate and graduate students and non-expert crystallography professionals in biochemistry, biophysics, and molecular biology. 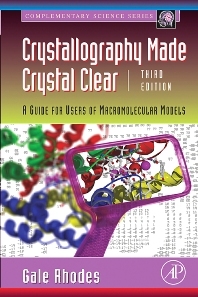 All protein and nucleic acid researchers need to understand X-ray crystallography in enough detail to analyze, generalize, and communicate with others in the field. This topic is not adequately covered in most undergraduate programs or taken at the time by researchers who eventually become interested in it.